At tea Hampshire were 66 for 6, a sequence of numbers appropriate for a disastrous day that left their chances in this match in ruins. If it wasn't quite hell, then they were certainly in the outer circles. Winston Churchill famously advised that if you are going through hell you should keep going, and after tea Hampshire kept going - the only trouble was they kept going deeper into its fiery bowels. They ended the day 41 for 2 following on, having been bowled out for just 147, their lowest completed first-class total for four years. Despite losing the entire morning session to rain the match hasn't so much slowed down as accelerated, and rapidly at that. Sixteen wickets fell on a day in which the rain and a few hours under covers perhaps spiced up an already difficult pitch. It was movement in the air, rather than off the pitch, that was the factor most instrumental in Somerset's success with the ball. Alfonso Thomas tore the heart out of Hampshire's top order with a classical display of swing bowling, taking 3 for 15 in a superb seven-over spell, four of which were maidens. Thomas used the fading outswinger as his stock ball and the angled inswinger as his shock ball, and was rewarded justly for his mastery. It was batting ineptitude that took the first wicket though, as Jimmy Adams clipped Thomas straight to Tom Abell at short midwicket. Michael Carberry was the next man to fall, pushing forward to Thomas to be caught behind. In Thomas' next over Sean Terry, who had survived a huge appeal for lbw the ball previously, was trapped in front shouldering arms to leave Hampshire reeling at 21 for 3. The ball was not swinging massively but enough to find the edges and muddle the minds of the Hampshire batsmen. Somerset may perhaps regret giving the new ball to Lewis Gregory, who bowled too wide in his first spell and was removed from the attack after five overs, although not before Terry had slashed a remarkable six over backward point and Liam Dawson had hit back-to-back fours. The introduction of Craig Overton, fresh from his time with the England ODI squad, immediately brought a wicket. Will Smith, driving expansively at a wide ball, was caught brilliantly in the slip cordon by Gregory. While Thomas found movement in the air, Overton found it off the pitch and for an enthralling period the two bowled wonderfully in tandem as Dawson and Adam Wheater battled hard to find a foothold in Hampshire's innings. A flurry of boundaries took Hampshire past 50 but Overton then got one to jag away from Dawson who only succeeded in edging it to wicketkeeper Michael Bates. Bates received the loudest reception of any player, on either side, when he walked out to bat earlier in the day. By contrast, there was an almost awkward silence when his replacement at Hampshire, Wheater, walked out to bat. Wheater did not last long, scoring 13 before he was bowled by Gregory to leave Hampshire six down. With the sun out after tea the pitch seemed a little easier and Sean Ervine and Gareth Berg put on 40 for the seventh wicket, the largest partnership of the innings, before Jim Allenby joined in on the wicket-taking fun, bowling Ervine, who had taken a nasty blow on the hand earlier, for 23. Going purely by first-class averages, Berg and Danny Briggs existed as the last line of defence between Hampshire and the follow-on. Although they battled admirably, a rip-snorting delivery from Overton that rose sharply to take the gloves of Berg and was caught at gully ended their resistance. Hampshire were bowled out shortly after and Marcus Trescothick had little hesitation in putting the home side back. Two more wickets would fall, those of Adams and Terry, to complete a remarkable day that left Hampshire trailing by 158 runs and staring at a huge defeat. Their efforts in taking 4 for 36 in just under 45 minutes to leave Somerset four runs short of the fourth batting point had long since faded. 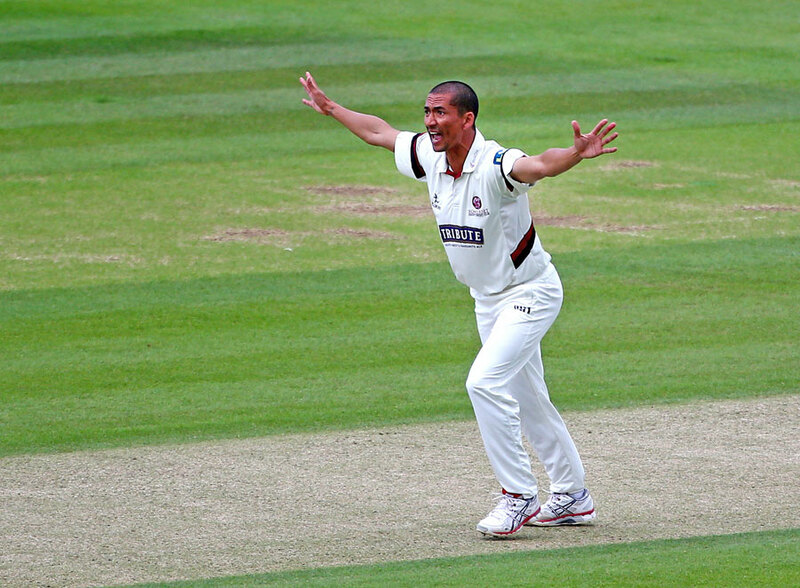 Berg, who toiled hard on day one, was rewarded with three of the four wickets to fall. In the innings break Hampshire would have been quietly pleased with themselves, given that Somerset had been 286 for 4. By the time they were next off the pitch, things were very different.